The HDF Group is excited to announce HDF Compass, a visual tool to navigate HDF5 files and other resources (local and remote). HDF Compass enables you to view datasets, attributes, and groups. Simple line, image, and contour plots are supported as well. HDF Compass is cross-platform and runs on Windows (7 or later), Linux (x86, 64bit), and Mac OS X (Mountain Lion or later). HDF Compass does not replace HDFView, but is intended as a simple, focused application with an emphasis on a native UI experience. One difference is that HDF Compass does not provide any editing functionality (which enables the UI to be less cluttered). In addition to viewing HDF5 files, Compass has a plugin architecture that can support other file formats or remote resources. In addition to HDF5, Compass comes with plugins for ASCII Grid, BAG, and OPeNDAP resources. See the Compass Documentation (link to the left) for additional information on the plugin architecture. With HDF Compass we encourage a community development model where interested parties can submit fixes and enhancements via GitHub. If you have some knowledge of Python and interest in improving Compass, please contribute! To run HDF Compass from source you need Python 2.7 along with the Python packages: wxpython, matplotlib, and pydap. As a Python application, Compass can be run directly from the source tree, but for convenience you may want to use the “Frozen” binaries for Mac or Windows. 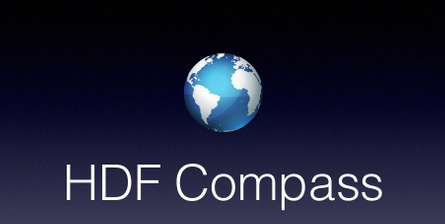 Copyright and License information for HDF Compass can be found on the Licenses and Copyrights page. Please submit feedback using one of the links below. Compass was initially developed by Andrew Collette, a research scientist at the University of Colorado’s Laboratory for Atmospheric and Space Physics. The BAG plugin was developed by Giuseppe Masetti of the Chase Ocean Engineering Lab.